Ashland Viscosi knew two things to be true: she wanted to be a Peace Corps volunteer, and she wanted to be an attorney. So how did she end up in Austin, leading a community for creatives? Ashland takes us on the journey of how she restarted her career, reshaped her path, and empowers others to do the same. 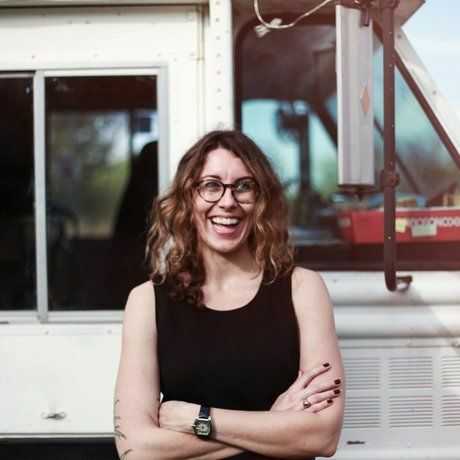 Ashland is the founder of Creatives Meet Business (CMB), an event and podcast series based in Austin for creatives of all disciplines to define themselves as artists and creatives AND small business owners. The event series helps anyone wanting to make a living as a maker learn how to become sustainable in their artistic craft. She also hosts, produces, and edits the Creatives Meet Business podcast. Ashland values collaboration, connectivity, and accessibility of knowledge and information and wanted to create something unique for the community. The result was CMBXP, an annual three-day experience featuring over 50 hands-on workshops that helps artists and creatives in real-time with artistry, business, marketing, and storytelling. Before founding both CMB and CMBXP, Ashland worked in film and production. At the same time, she honed her fundraising, marketing, and event production skills during her years at an arts-based non-profit. If that wasn’t enough, she also volunteers as the Sponsor Relations Coordinator with the ATX Television Festival and moderates at the Austin Film Festival. She also really loves cheese plates.